This dish is as easy-going as summertime itself. 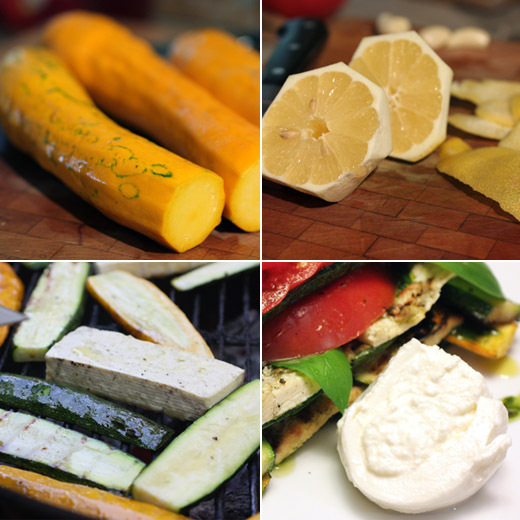 Zucchini, yellow squash, and slabs of tofu are briefly grilled and then tossed in a lemon marinade. They can be used right away while still warm, or as they did in my case, they can sit in the refrigerator overnight until they're layered into this lasagna-like construction. The lasagna itself can be served warm, room temperature, or chilled. You can skip the grilled tofu and use slices of fresh mozzarella instead. Or, as I did, you can serve burrata on the side. The fussiest element of this dish is probably the pesto, but that's a treat for me to make because my basil plants are growing strong despite our unstoppable heat. Then, there are the tomatoes which only have to be cut into thick slices, and they're ready to go. This dish has a completely no worries kind of attitude. You can't go wrong with it. The recipe is from the March gardening issue of Living magazine, and I held onto it until big, red, heirloom tomatoes were here and locally grown zucchini and dark, yellow squash were at the peak of their season. The zucchini and squash were cut into long, thin slices, and the tofu was pressed to remove water and cut into thick slabs. Everything was brushed with olive oil and seasoned with salt and pepper and grilled for a few minutes per side. After grilling, the vegetables and tofu were placed in a lemon marinade. To make the marinade, olive oil was heated with lemon zest and garlic, and then lemon juice was added. I left the vegetables and tofu covered in marinade in a container in the refrigerator overnight. Next, basil pesto was made the usual way. Toasted pine nuts and garlic were pureed in the food processor, basil leaves were added, olive oil was drizzled in while the motor was running, and it was seasoned with salt and pepper. Then, the lasagna was assembled. 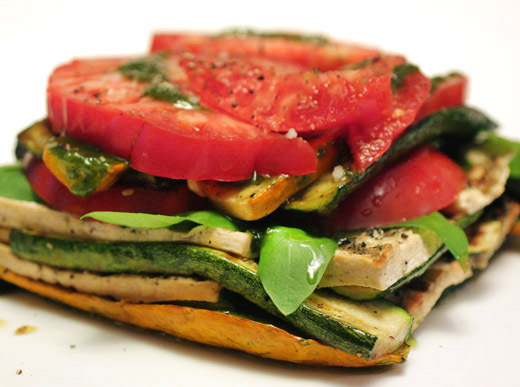 The tofu was cut into thinner slices before stacking with the zucchini and squash. Tomato slices and whole basil leaves were included in the layers, and the pesto was dribbled here and there while building. Once completed, the lasagna could go have gone back into the refrigerator, but I served it at room temperature. Surprisingly and pleasantly, it was easy to cut and the layers stayed in place as portions were transferred to plates. A little smoky flavor from the grill was welcome among the summer vegetables and tofu, and the ripe tomatoes and basil pesto were a fitting sauce. For a bunch of simple, laid-back ingredients, they all came together into a substantial, flavorful, finished meal. What a wonderful idea! That dish is so colorful, tasty and beautiful. A great way of using all those fabulous summer veggies. Oh yes! its held its shape so beautifully! I love this representation of tofu - I don't think I've ever seen it like this in lasagna sheet form - wonderful! The layering design is also really interesting with the veggies interspersed. Very nice Lisa! That looks so much fresher and more summerish than normal lasagna. Lighter, and no hot oven - its perfect. I love anything with these summer veggies, even with the tofu! Love your summer stack! Stand as an entree definitely. I love how you've made it possible to eat lasagna even in summertime. The traditional version is just way too heavy when the temperatures soar. Plus, who wants to turn on the oven for that length of time. This is a perfect version for this time of year. Perfect also for everyone who has an abundance of courgette at the moment..:) looks great! Mmm this meal is ideal, in my opinion. Especially if I use tofu AND mozzarella! Perfect for alfresco lunch! mmm.. Very nice Summer dish, Lisa! I have never seen such a beautiful and colorful lasagna! I love how healthy and delicious it looks! Lisa, using tofu instead of pasta for this dish is absolutely great. I'll definitely try this one since I have a couple of trays of tofu in my fridge. Looks beautiful with all the veggies. Everything you make is so pretty! I love how you layer it! But mmmm this is eating at its best: healthy and full of fabulous flavors. I need to take a cue from you and start cooking like this. It is also the perfect way to get my tofu-wary family to eat tofu (which I love). This dish looks so colorful and healthy! I like the idea! An excellent use for the remaining 4 pounds of zucchini in my refrigerator. I think I could get Eric to buy off on this dish if I took up your suggestion to sub mozarella for the tofu. Also, love the layer of basil leaves in addition to the pesto. Unfortunately, my basil isn't quite thriving. Reminds me that I need to try moving the pot to another location. I love tofu! This sounds so good, great idea! Incredible presentation of a dish so simple yet delicious! what an easy and healthy dish. Love it! This dish just screams "summer" - what a perfect solution for a bumper crop of zucchini and tomatoes - love the versatility - Buratta, tofu, mozzarella ... it's all good!!! This is so pretty Lisa and I'm sure it was absolutely delicious. 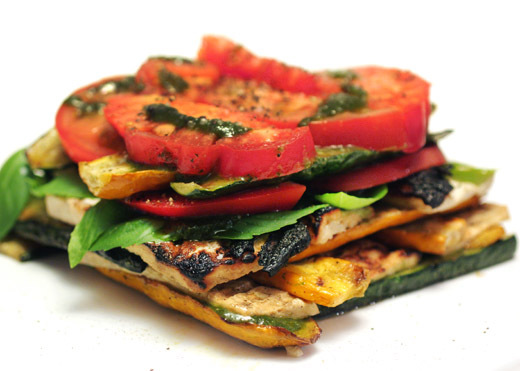 It is a great way to dress up grilled vegetables. I love grilling them but I do get a little tired of platters of grilled veg for dinner. Love this vegetarian delight. So colourful and bursting with flavours. Now that's a healthy lasagna .. the problem is how to convince the husband! he doesn't like tofu! look at those layers! this is truly a celebration of all things garden grown! For lasagna, this looks light and so tasty with all the beautiful garden bounty. Pretty! I like the layered, terrine look.